Extras such as tray charges, laundry, telephone calls, faxes, etc. 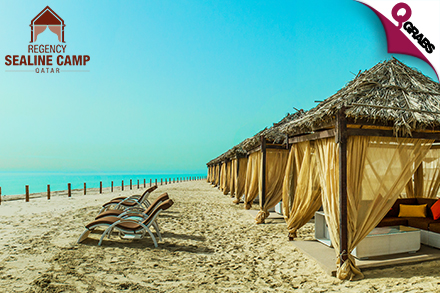 Explore the beauty of the desert & sea while you stay in the luxury of a 5* camp! First enjoy a healthy lunch buffet with meat skewers, salads and breads and then dine on a delicious Arabian barbecue dinner buffet! Be close to the sea for beach-time fun! Access to Holiday Desert Camp facilities and amenities for the ultimate experience! Includes a continental breakfast buffet with a tea & coffee station! Tea/coffee facilities in the room! Complimentary WIFI, 50’’ Flat Screen, bathroom amenities, security, air conditioning, 24-hour room service and more in each Royal Tent! Includes a pick-up & drop-off service from Sealine Roundabout for easy access! Activities like dune-bashing, camel riding and trips to Inland Sea can be purchased at Regency Holiday Camp! 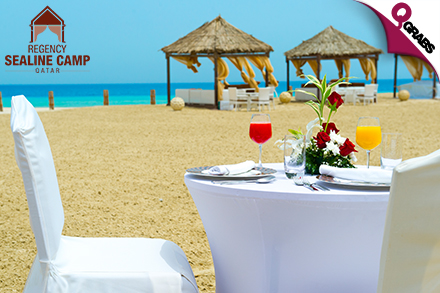 Where sand meets sea, you can spend a night under the stars in 5* luxury! Hey, that kinda rhymed, hehe! You, of course, won’t be directly under that stars because you’ll have a killer Royal tent with your own flat screen… not roughing it at all!! 50% off a desert adventure with the luxuries of home! A Blend of Traditional Arabian Design and Modern Comfort Nestled in a destination where the desert and sea meet harmoniously, Regency Holiday Desert Camp is a blend of traditional design coupled with modern comfort. At one hour away from the City of Doha, the luxury desert camp offers a range of activities including dune bashing with 4×4 vehicles, quad biking across the terrain and camel riding through the desert. A traditional Arabian lounge serves as the focal point of the camp where guests can immerse themselves and enjoy meals under the stars. Classic cuisine and other succulent dishes, chosen specifically to enhance the desert camp experience, are presented for our guest’s selection. Explore, experience and enjoy Doha’s backyard in comfort.